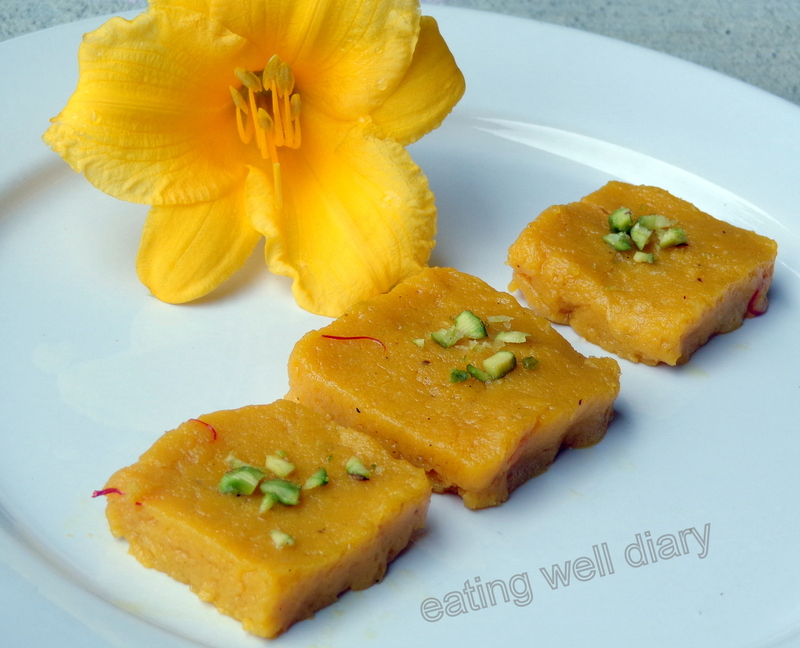 ‘Halwa’ is a decadent Indian sweet, usually made by boiling grain or vegetable like carrot in milk with constant stirring. I generally avoid recipes that call for stirring for a long time on low heat. But there are times when you would like to produce a quick dessert for guests with what is available in the pantry. 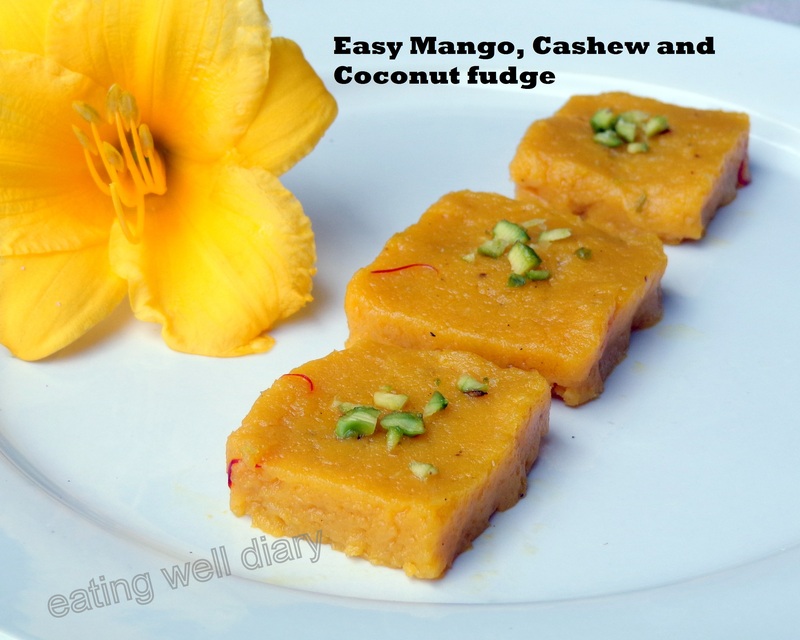 I have found that a combination of canned mango pulp, soaked cashews and coconut can make a quick and delicious, not-so-decadent halwa! 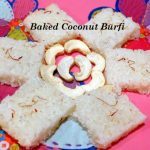 The cashews and coconut give it substance and volume, not to mention excellent flavor. It became such a hit when I made it the first time, that the kids are asking for ‘that mango sweet’ very often! 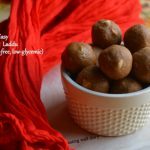 Bringing this sweet treat to Fiesta Friday #20 hosted by Angie of The Novice Gardener. I’m eagerly waiting for everyone to take a virtual bite of this! I also tend to use a non-stick teflon coated pan very rarely, only to make Indian sweets like this, but it does make life a lot easier. 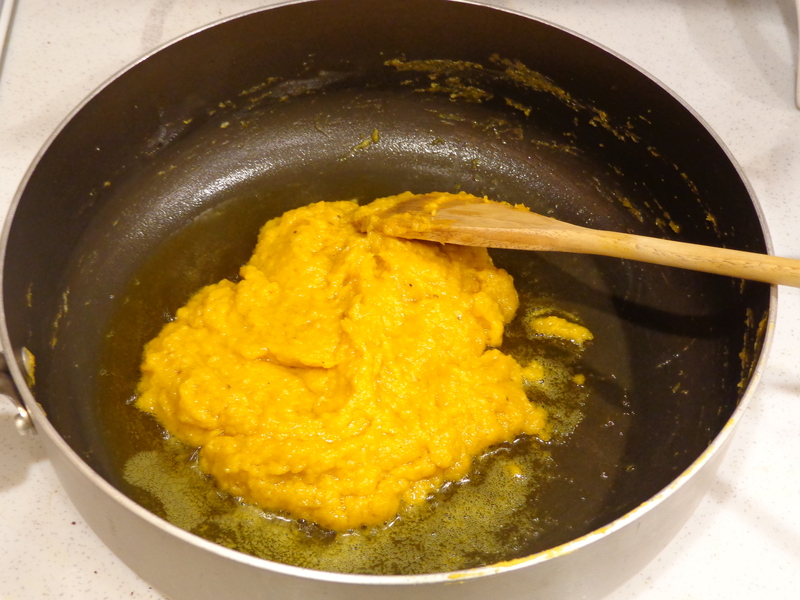 Half of the ghee (clarified butter) that is used can be recovered at the end of the cooking process. 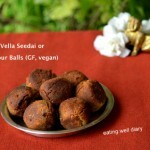 At the end of 30 minutes, it leaves the sides of the pan: recover the ghee! 1. Soak cashews in hot water for 30 minutes-1 hour. Drain and rinse once. 2. Grind cashews with minimum amount of water (about 1/4 cup); add coconut and mango pulp, blend till smooth. 3. Transfer to a non-stick pan, add sugar, 1 tbsp. ghee and stir often on medium heat. Also add cardamom powder and saffron strands. 4. When the volume is reduced to half, add another tbsp. 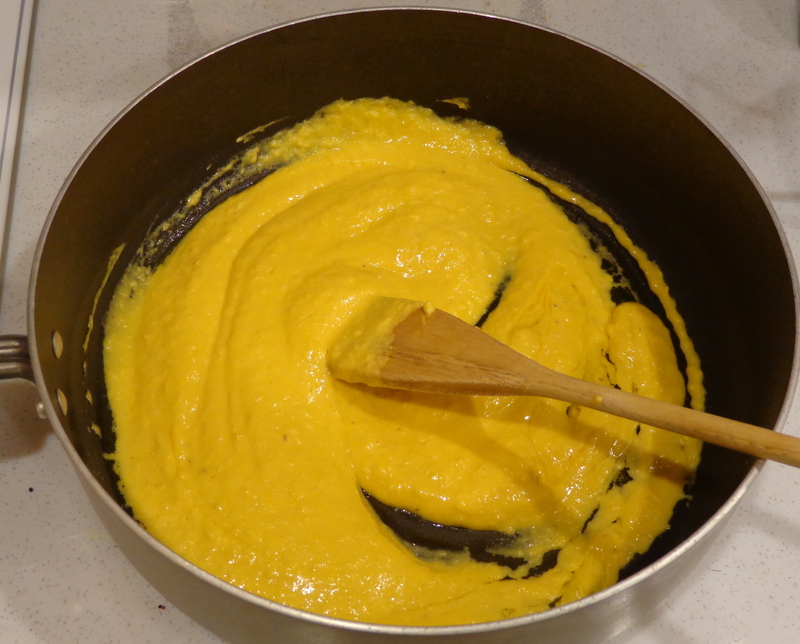 of ghee, stir till the mixture leaves the sides of the pan. At this time, the ghee can be taken out with a spoon. Use it to grease a square dish. 5. Transfer the mixture to the greased dish. Allow to cool completely (can be placed in the fridge) before cutting it into squares. Garnish with pistachio pieces. 6. Store in the fridge for up to a week. If fresh mangoes are used, extra sugar will have to be added, depending on the sweetness of mangoes. Nice! I can understand why your kids would ask for it so much! Yes, so I had to make more; went and got another tin of mango! Nice. 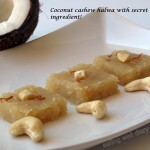 Combining two delicious ingredients- cashews n mango! Irresistible! Hi Apsara! I love being introduced to new food, and this sounds wonderful! Wow!! Looks so good! Great colours! it did. thank you, Aiswarya! Happy fiesta friday! great combination! mango and cashews! delicious! thanks, Simi. Happy FF to you too! Made it earlier – it’s great! So simple and tasty. Very glad you shared your recipe! I will be making it again! wow! love the combo…will try it soon…did u get the mango pulp tin from Indian store or else where? yes, Kripa. From the Indian store, I think Kesar mango pulp. Sounds delicious, Aspara, and a great “healthier” dessert choice. The color is gorgeous…which I’m assuming is from the mango and the few strands of saffron. Lovely offering for FF! thank you, Nancy. Have a great weekend. Wonderful, Apsara. I love halva (or halwa) but have never had any other flavor than plain. Yum! What a great recipe Apsara! Absolutely divine :). thank you, Fae. Happy FF to you too and many thanks for hosting! Oooo love halwa, but I’ve never tried making it. Perhaps I will start now, what a great combo too. thanks Loretta. I hope it works well when you try it out! So creative! It looks great!! What a delicious sounding & looking treat! Is the name of the dessert at all related to middle eastern halvah with sesame? I’ve got a recipe for it! A modified version of course but it was so good! And I’m thinking I could tweak yours too. It looks so good I need to try it. I’ve also been wondering if I find truly proper ghee if I can eat it without consequence. Ah, yes, you’re intolerant to dairy, right? Coconut oil could be used in it’s place, the expeller pressed type that will not have an overpowering smell. I will check your blog for the halvah! you’re welcome, Kloe. Glad you like it! Really looks wonderful and delicious Apsara, I always thought Halwa was made from Sesame but am finding out there are so many variations. Thank you for bringing to the feast! Mango and coconut together should be a great combination! I have to try this. I have never heard of this dessert before, but what a great combination of flavors! It is so pretty, too. I like learning about foods that are new to me. 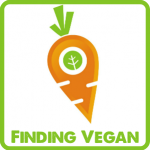 Thanks so much for sharing this, Apsara!